My biggest boy, the last in my series of ‘right here, right now’ posts. This time nine years ago I was 34 weeks through an easy pregnancy, and blown away by the fact that I was soon to meet my long awaited baby. Nine years! He is growing into a little man faster than I am ready for! Already nearly as tall as me, he managed to actually lift me off my feet yesterday – no mean feat as I’m not as spritely as I once was, by any means. We occasionally go running together and though he claims to be ‘rubbish’, I’m pretty sure he’ll be outrunning me in the not too distant future. His stamina amazes me – two hours of canoeing on a Sunday doesn’t seem to leave him remotely tired – though he can and does eat like a horse afterwards! My nearly-nine-year old is brilliant company. He is a serious soul with plenty to say, and while he can hold his own in a group, he’s always much happier with a on-on-one conversation, and I cherish our chats after his sister and brother have fallen asleep. It’s then he takes me on tours of the creative and complex Minecraft worlds he has built, full of roller coasters and tree houses and amazing creations that he is constantly tweaking and perfecting day by day. I’m astounded by the thought and the imagination that he puts into these creations, and though I was sceptical about the game itself at first, I can see that he is gaining a great deal from being able to create and manage his own private places, even just in a virtual sense. It’s also during these post-bedtime chats that he shares with me his worries about life, which sometimes overwhelm him to the point where he goes into major meltdown mode. We’ve been working together to find ways to head off a meltdown before it takes over completely, and also talking a lot recently about how it’s as important for him to be kind to himself, as it is to be kind to others. This last point seems to have resonated with him more than any other confidence-building strategies I have tried, and I’m so, so happy to see him enter his tenth year in a much calmer and happier frame of mind…long may it continue! I’ve written before about taking small steps with my lovely, big hearted boy, and now it seems he is taking small steps of his own – recently his browsing history included the phrase ‘how to deal with disappointment’ in amongst the endless Minecraft and Stampy Longnose based queries. I found this heartbreaking at the time – but on reflection I think perhaps it shows a developing maturity and a growing realisation that he is not helpless in the face of whatever life throws at him. Though part of me wishes it wasn’t happening so soon, I’m proudly watching the way my biggest boy is taking the first steps towards the grownup world – he walked the short distance to his best friend’s house on his own yesterday, and he’s also been on an errand to the local shop for the Husband – something which he was very chuffed about indeed. He’s started wandering off to the kitchen to make his own toast at random times of the day , and asking me to make him the odd cup of tea – all small rites of passage on the growing-up journey…I only hope the next years don’t fly past too quickly! My biggest boy, there’s so much to love about you, and I hope with all my heart that you are beginning to understand that. 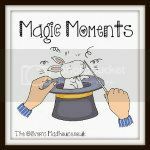 I’m linking up with Magic Moments over at The Olivers Madhouse – there’s a bunch of posts over there full of happiness and joy, pop over and have a look! You’re right, they seem to need you more as they get older and their lives get more complicated. Thank you! It’s a case of finding my way, sometimes I am better at it than others! Wow isn’t it crazy how quickly time flies. My biggest boy is 7 and it still feels moments ago that he was born. Lovely post! Kate Thompson recently posted…“Combat” or “Survival” Mode? Thank you. He is, though he doesn’t believe it, but we’re working on it. It is a tricky age for them to negotiate – but you’re right, they are very good company at this age! Thank you! One on one time is precious – it’s hard to get enough with any of them sadly. It’s fascinating watching their development, especially at this age. What a beautiful posts. It seems the milestones get less defined but more pivotal in the journey as an individual. A beautifully written post. Thank you! The milestones do change in their nature, I can’t believe it used to be about taking one or two wobbly steps with a baby walker and now it’s about going to the shop on his own! It does go horribly fast! “A serious soul with plenty to say” – sounds a lot like my oldest son, who’s only six. It’s such a journey of discovery watching kids grow up – and a privilege too. But where does the time go?!? I wish I knew that – and I wish I could bottle it! Such a lovely post – my 9 year old is very, very similar to yours in that he worries too much about other people and can sometimes seem likes hes carrying the world on his shoulders. We’re working on similar things to you but in general he’s such a pleasure to be around and I love chatting to him and just being with him. Thank you – it’s such a lovely age, though I have said that about all their ages when they are in them! Thank you! He is very special! He is, he’s fab. But scary indeed to see the years whizzing by! It is the pre-bedtime chats that are the most revealing with all of mine I find, in the day they’re just whirlwinds and far too busy to talk! What a beautiful post. He sounds like a super chap, you must be very proud. I am, he’s brilliant – all of them are, I’m very lucky! beautiful post, they grow so fast! My eldest will be 11 on Thursday! Oh my goodness eleven sounds so grown up, I want it all to stop! Gosh what a beautiful post, it actually brought tears to my eyes!! Maybe because I can recognise so much in my eldest, my 7 year old boy. What a lovely piece of writing and what a lovely boy he sounds! Thank you – sorry! He is lovely indeed. I think boys do tend to have the weight of the world on them more than girls in the primary school years! Reading this is so lovely.Sharing those special times when you can share a heart to heart with your kids is precious. Never loose that time its so very important. Thank you – I won’t, I love my one-on-one time with each of them. Never enough of it though! I can’t relate to it yet, I’m not Mummy myself but it looks like he’s such a clever boy! I hope he will grow up to be as amazing young man as he is now! Sylvia @ Happiness is homemade recently posted…Smoky prawns spaghetti / Makaron z wędzonymi krewetkami. this is such a sweet and thoughtful post! My older boy is ten and I am loving this age, the toddler tantrums are in the past, the teen tantrums not here yet, and he is such lovely company! Sadly in a house with a teenager and a toddler operating at full volume, I sometimes worry that he gets the least attention because he is so good! Sonya Cisco recently posted…Roll up, roll up! The Camp Bestival Circus is coming! I loved reading this post, it was really touching. Your son is clearly a very thoughtful and kind little boy. My 9 year old is also a Minecraft fan. It allows them to be very creative doesn’t it? It is a strange age, not quite a child, not yet a teenager. Your son sounds wonderful, mature and thoughtful. What a lovely heartfelt post. My eldest is 14 and the years are flying past far too quickly for my liking. I love seeing him grow and change but I miss the little boy he once was.